Hispid annual or biennial, up to 1.25 m tall; grown in warm countries for the musk-fragrant seeds and the showy yellow crimson-centered axillary fls. which are about 4 in across; leaves various, usually with deep divaricate narrow strongly and irregularly toothed lobes, but some of them shallowly lobed and maple-like, all sparsely hairy on both surfaces; bracts linear, much shorter than the spathaceous many-toothed caducous calyx; fruit oblong-acuminate, hairy, 3 in. or less long. 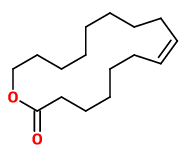 Main components of the monoester fraction of ambrette (Hibiscus abelmoschus seeds) were (E,E)-2,6-farnesyl acetate (70%), (Z,E)-2,6-farnesyl acetate (6%), (Z)-7-hexadecen-16-olide (natural ambrettolide, 12%) and (Z)-9-octadecen-18-olide (oxacyclononadec-10-en-2-one, 4.5%). The commercial extract or essential oil (hydrodistillation) from ambrette seeds is long been used in perfumery for its sweet, floral-musky, winelike odor. 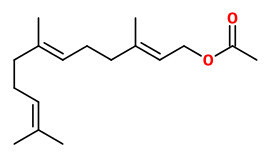 A mechanic separation of the water-soaked seed coats followed by alcoholic extraction and liquid-liquid extraction of the oleoresin obtained after removal of the alcoholic solvent with pentan or hexan, and removing fatty acids over a short column, led to an extract (0.24-0.29%) with sweet-smelling and lasting odor, almost free from fatty acids. Main components of this extract were decyl acetate (5.7%), dodecyl acetate (5.1%), farnesene (9.6%), (Z)-5-tetradecen-14-olide (1.3%), (Z)-5-tetradecenyl acetate (1.2%), (Z,E)-2,6-farnesyl acetate (3.8%), (E,E)-2,6-farnesyl acetate (50.4%), (Z)-7-hexadecen-16-olide (9.3%), (Z)-9-octadecen-18-olide (1.2%). The plant is cultivated for essential oil from the seeds, which has a musk-like odor and is used in perfumery. The seeds itself were formerly considered stimulant and antispasmodic. The tincture and the volatile oil are widely used in cosmetics like creams, lotions and soaps and as a food flavor. The seeds contain 14.5% fatty oil and 0.2-0.6% volatile oil, starch, methionine sulfoxide and phospholipids. Main constituents of the semisolid pale yellow volatile oil, extracted by steam distillation, are farnesol (42.3%) and ambrettolide (14.8%, omega-6-hexadecenlactone, lactone of ambrettolic acid), which is responsible for the musk-like odor. Hibiscus moschatus (Medik.) Salisb. as Abelmoschus moschatus Medik.